That’s one of the most alarming pieces of advice Peter (John McNeill) has for Lachlan (Scott Smart) on his first day of training as a meter reader in Sydney’s Eastern Suburbs. The well-off residents, he explains, tend to have mean dogs. The power company they work for, AusPower, has supplied them with a canine deterrent spray, but when the men test the nozzles both seem to be faulty. Life isn’t easy as a meter reader in Sydney and Smart, who is also the playwright behind The Readers, knows this from experience; he used to do the job himself. No wonder then that a key feature of The Readers is the myriad unfair working conditions for AusPowers’s foot soldiers. Their pay is docked if they don’t record a new reading every 15 minutes, and readers are so pressured to finish their rounds early that they won’t stop for lunch. Don’t even ask about the toilet break situation – let’s just say that Peter’s time-saving solution involves a clear alleyway and an empty bottle of energy drink. 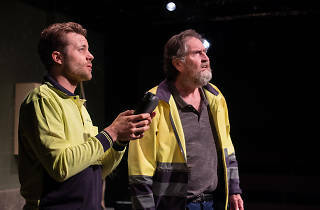 This is an outdoorsy play for an outdoorsy job, and Jeremy Allen’s simple set peppers the downstairs Belvoir space with power boxes and meters to read. Matt Cox’s lighting evokes leafy suburban sunshine, and Smart and McNeill have a comfortable, roaming relationship with the intimate space. And they build a gentle camaraderie between Lachlan, an aimless 28 year old who has freshly landed in Sydney, and Peter, a former schoolteacher who meter reads to cover the costs of, and be available for, his elderly father’s serious medical treatments. They both treat the constraints of the job differently – their need for it spring from such different wells – but they pass the time with friendly chat and a shared interest in books. The face of all that corporate inequality is ever-present though and its name is Annie (Anni Finsterer), a one-time reader who has recently made the transition into the office. It’s a promotion laden with perks, but her relationship to the company is fraught, and Annie seems to lack as much control over her situation as the men. This turns into a sour take on a love triangle so full of harassment, manipulation, and discomfort on all sides that it hurts to look at. Still, director Elizabeth Nabben gives The Readers a pleasing and genial air, which pairs well with Smart’s easy dialogue. It’s an afternoon stroll of a play that would rather summon a sense of place and a general feeling than make dark and pronounced statements. This means when the personal relationships between our three characters take a turn, we probably shouldn’t be laughing at their actions (and the audience does laugh). The conflict is only a glancing one, soon brushed over and forgiven as part of the mess of life. It drives the plot forward, but because these surprising behaviours are never closely examined it’s a muted development, seemingly inevitable, and borderline superficial. That treatment is both a disappointment and a relief. A relief, because our time is best spent with Lachlan and Peter, two men discovering a conditional, but genuine-seeming friendship. 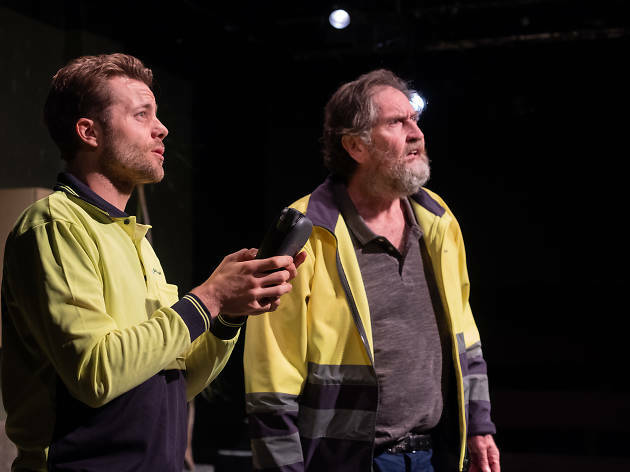 It’s a slice of comfort in a job, and a life, that’s reasonably tough, and even when their new bond is tested, the play makes an argument for the solidarity of mateship. It’s a good message to linger on.